Melchester Rovers unveils new shirt sponsor! Melchester Rovers, the legendary football team featured in iconic British football comic Roy of the Rovers, is delighted to unveil its official shirt sponsor for the 2018/19 season: The Totally Football Show. All of which makes it the perfect fit for Melchester Rovers, as the club builds up to the exciting 2018 reboot of Roy of the Rovers. And while Melchester Rovers might be fictional, the relationship between TheTotally Football Show and the club is very real. The Totally Football Show’s logo will appear on the brand new Rovers shirt, and a special podcast will air before the publication of the first new Roy of the Rovers graphic novel in the autumn. 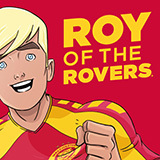 New Roy of the Rovers logo unveiled! New Melchester Rovers crest revealed!